When I tell you this post is down to the wire, I mean it’s DOWN TO THE WIRE! I actually photographed the room last week, but editing and hitting publish was the challenge here! 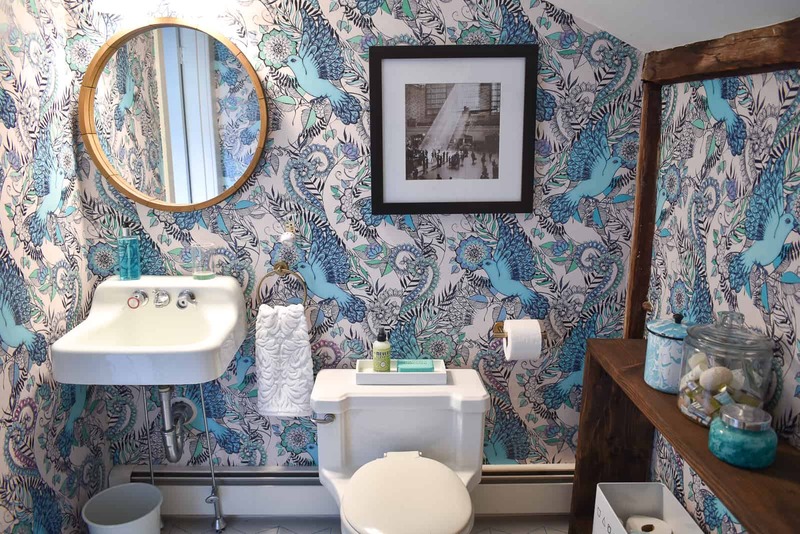 I digress… our third floor bathroom is DONE! Fin! Complete! With everything all said and done, this makeover was my favorite type: dramatic before/ after but not any real “heavy lifting”… i.e. mostly superficial! Let’s hop in the way way back machine and see how this room started, shall we? Dingy walls, dated floor, junky sconce, stupid storage, tiny mirror, no artwork… like a bad motel. You’ve pretty much seen the blow by blow so today’s post is mostly to see the whole thing all styled and purty. To get you up to speed, Week 1 I shared my vision for the space and gave you some glamour shots of the room in it’s BEFORE glory. Week 2: I built a new storage table and added some ball fringe to the shower curtain. I stained the table to match the exposed beams that are throughout the third floor, and I love that rich little bit of wood. Week 3, I tackled the wallpaper. And I LURVE it. 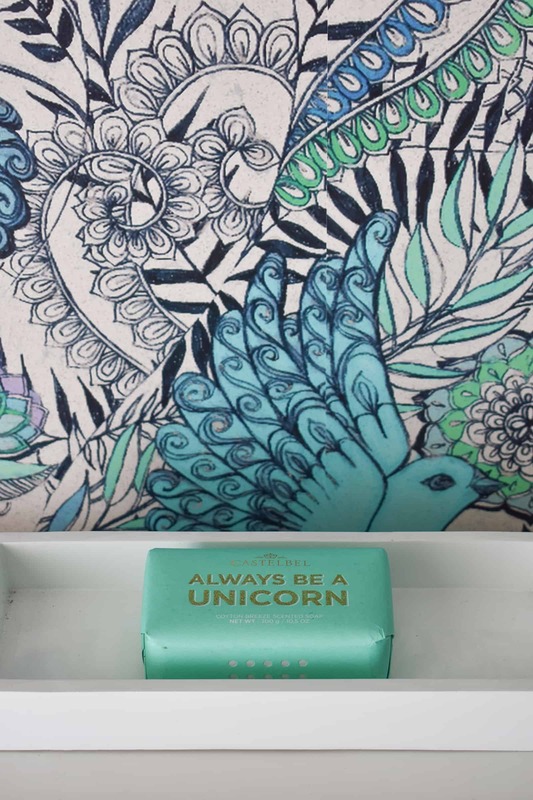 It’s from Spoonflower and was designed by the artist Micklyn Le Feuvre. So pretty! I’m no expert at wallpapering, but I’m getting better! Having that bright and colorful pattern in the space makes the whole room feel more modern and luxe. In my opinion. Week 4 and I gave the area right outside the bathroom a little love. 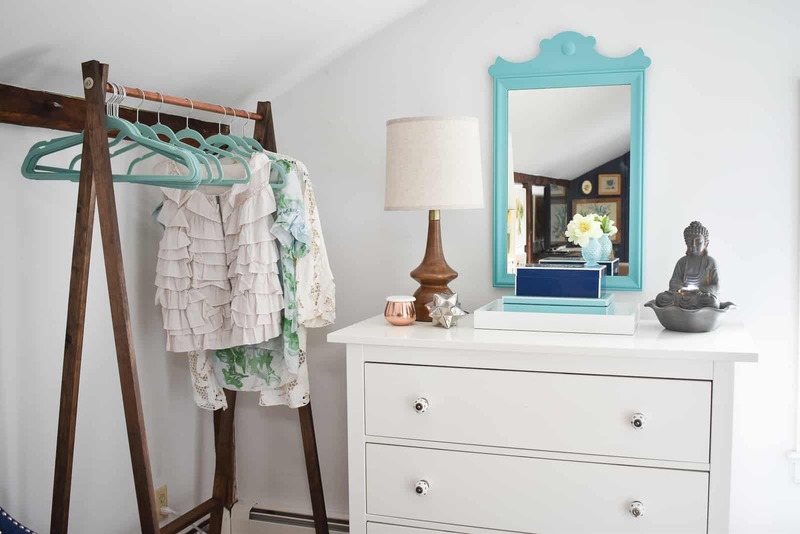 A new improved garment rack and a bright new mirror meant this tied in a bit more to the whole space. Week 6. I was a little nervous that this would take an eternity, but… it didn’t! I tackled the floor and gave it an awesome graphic treatment (for $5!) that meant the whole space looked fresh and updated, but… no tiling or demo involved. Win-win! Which brings us to today! The grand reveal! I mean, the room is like 4×8 so it’s not like there are any hidden angles you haven’t seen, but… I brought in a new light fixtures from Lamps Plus, a new round mirror from Target, artwork, and antique gold accessories and, voila. Wanna come stay with us just so you can use the guest bathroom? Thought so. And just for the grand finale… care to see the before/ after back to back?! Yeah… I thought you might. Thanks SO much to my amazing sponsors: Lamps Plus and Spoonflower. 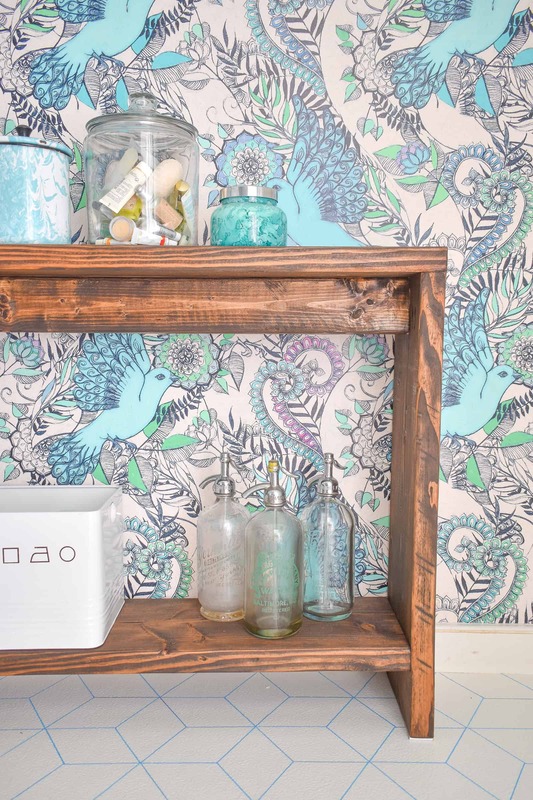 As I mentioned, that stunning wallpaper is from Spoonflower. 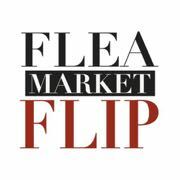 The blue chair, table lamp, Buddha fountain, light fixture, towel ring, and black and white print are all from Lamps Plus. 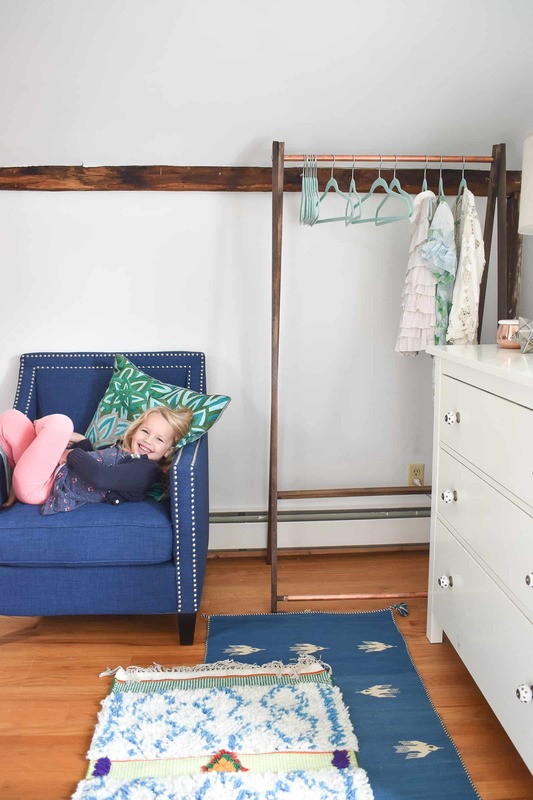 Mostly thanks to Linda from Calling It Home for yet another fun packed One Room Challenge! 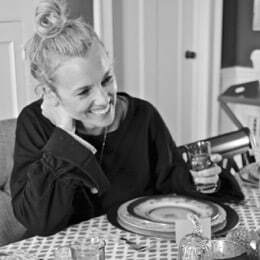 Make SURE you head over to the link up and congratulate everyone who finished and ogle the amazing reveals! Charlotte! This is amazing! I still cannot believe you just painted the floor! 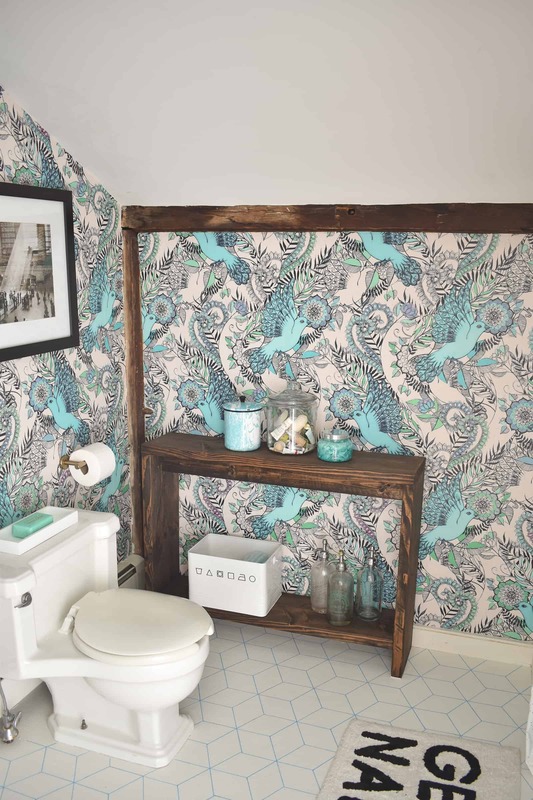 i wish i could do this to one of our bathrooms! No question, it’s a gamble, but… for a space like this, a risk I was totally willing to take because it gets so little use! 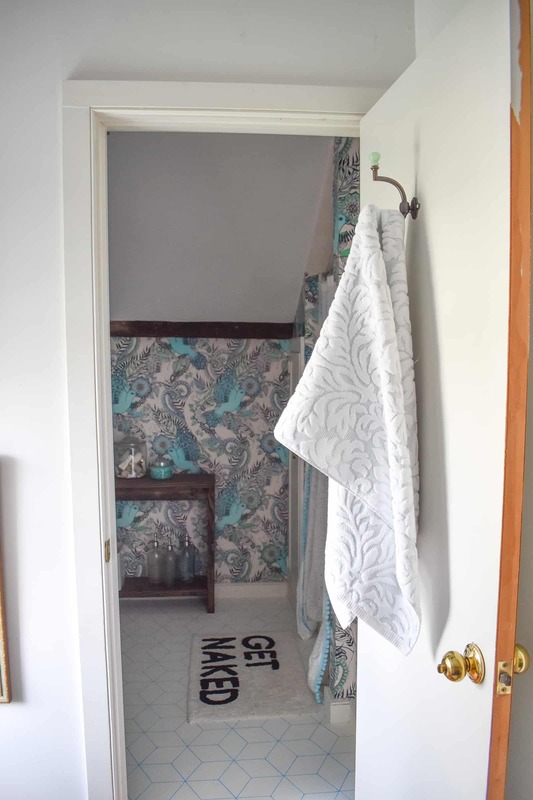 just found you through the one room challenge link up and im smitten with your bathroom! 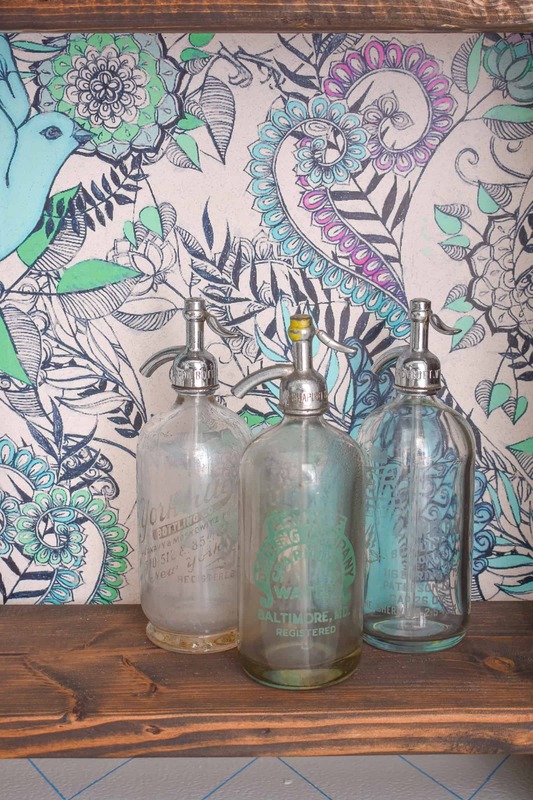 That wallpaper is perfection and so are the little vintage details! Thanks for inspiring me. 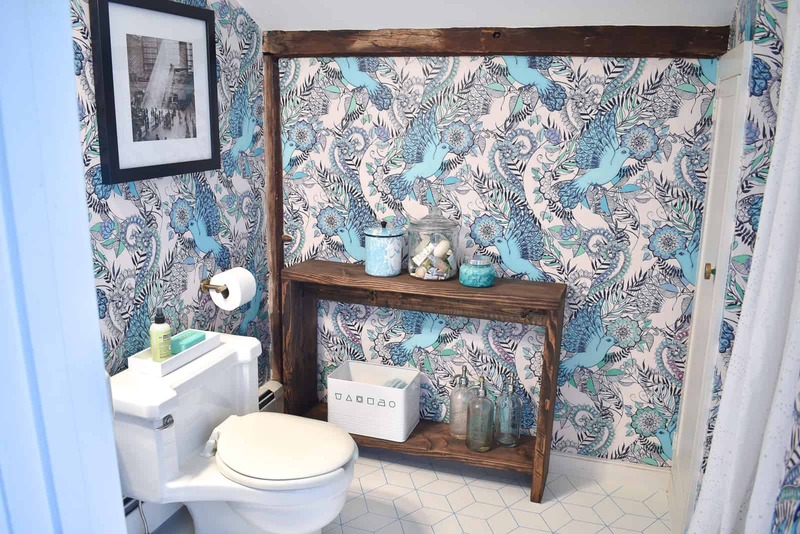 I would love to turn a little powder room into a masterpiece too! Thanks, Bethany! I can’t wait to have some time to go visit the other spaces! 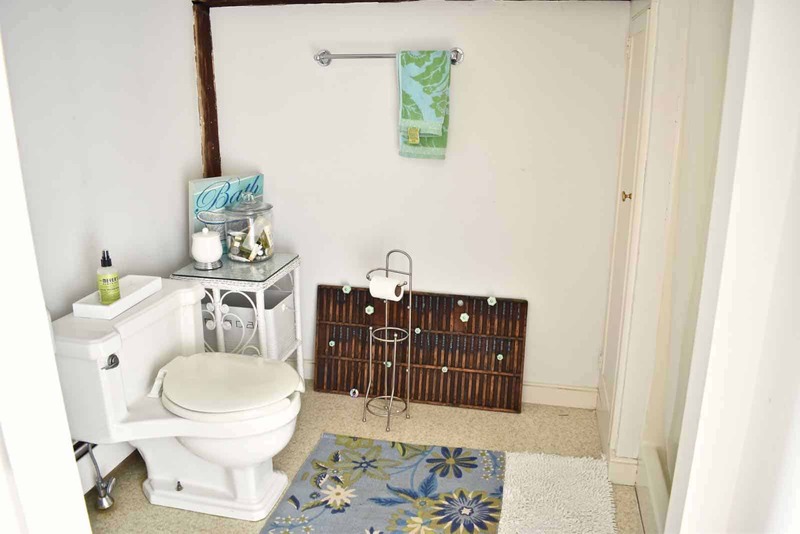 I love small bathrooms… fun to make colorful! Charlotte, it is so fabulous! I love how you left the exposed beams the wood color and stained the new storage piece to match. You are the queen of accessorizing! I luuuurve it too! SO PRETTY! 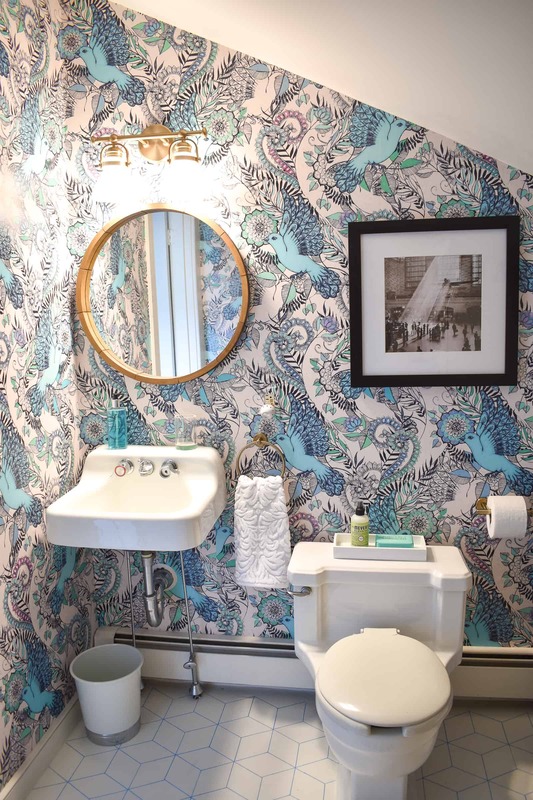 That wallpaper is beautiful and it plays so well with the blue pattern on the floor. Also love all the little details and the layered rugs in front of the dresser. Really beautiful work! Thanks, Michaela! This was such a fun little space to play around in! That looks amazing! You definitely made a big and dramatic change in there. Ha! Yah… it feels like a different room! Thank you! Beautiful, Charlotte! 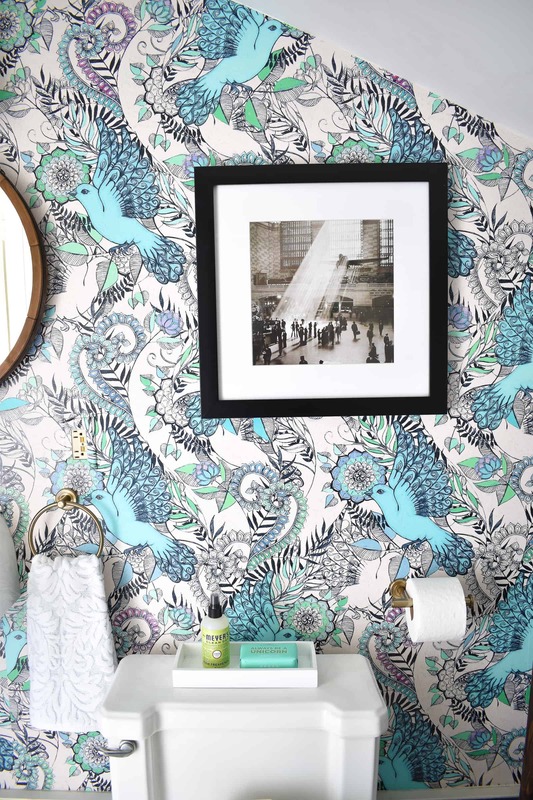 I love your wallpaper print, and that floor – so brilliant! 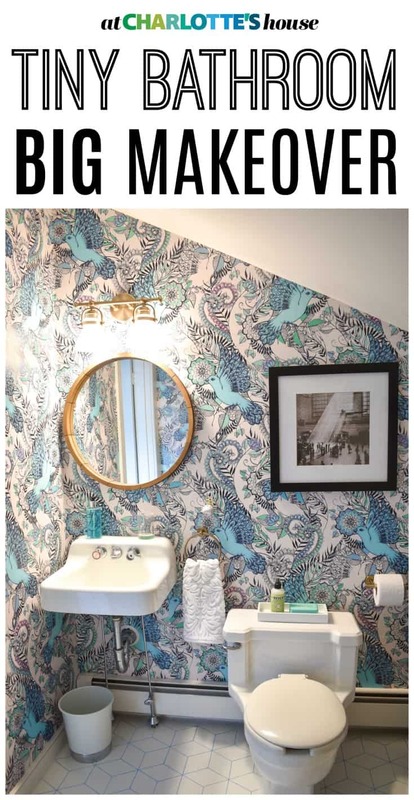 I, also used wallpaper in my Bthrm makeover and it was so very time-consuming but worth it. I’ve gotten a little better at it, but yes… it takes some time! I can’t wait to have a few minutes to go around and see everyone’s reveals! This is a stunner! 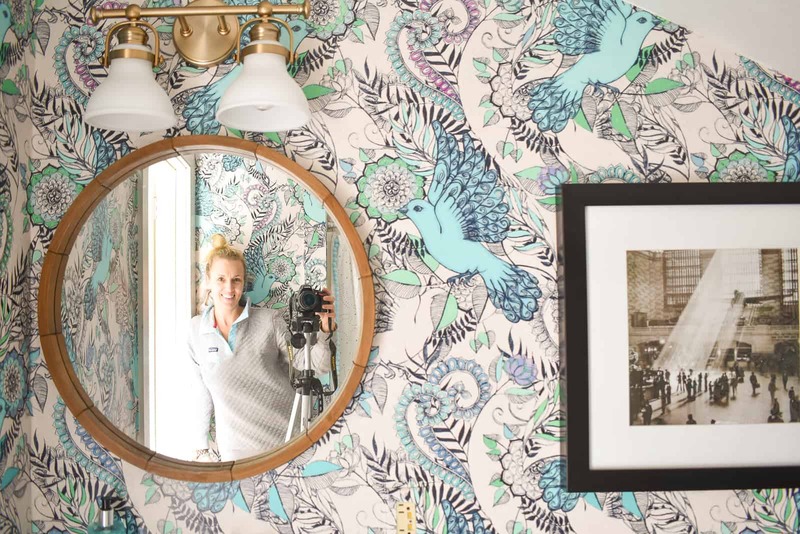 That wallpaper and floor are blowing my mind! I’m honored to have done the ORC with you! Oh my gosh… thank you! I can’t wait to have a minute to go around and visit everyone’s rooms! I love the ORC! The caps is just the way the website is! And thank you! 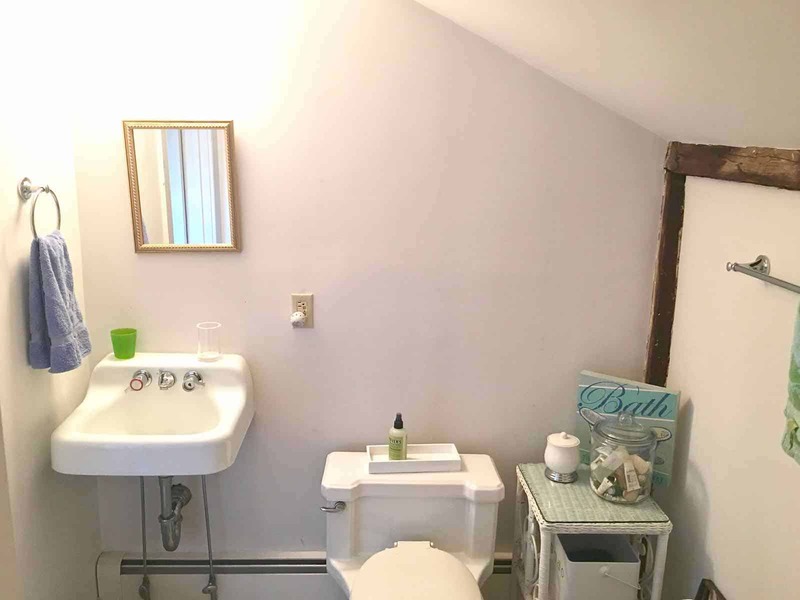 The space is so tight that centered over the toilet would have felt a little crunched up to the mirror! Love this transformation charlotte! That wall paper is so fab, My fav is the sweet pic of your girl! Beautifully done! Thanks, Carli! She’s a happy camper that’s for sure! Thanks, Libbie! 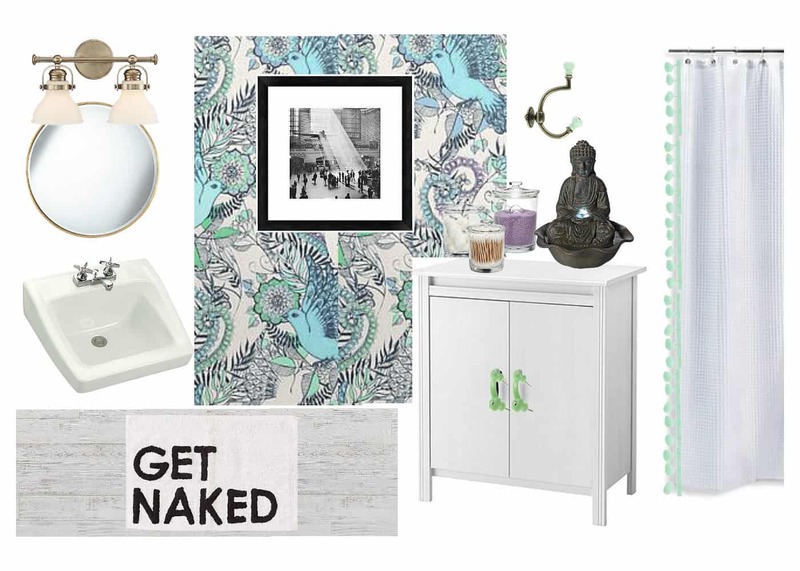 I love bringing color into a smaller space like a bathroom! Gorgeous!! 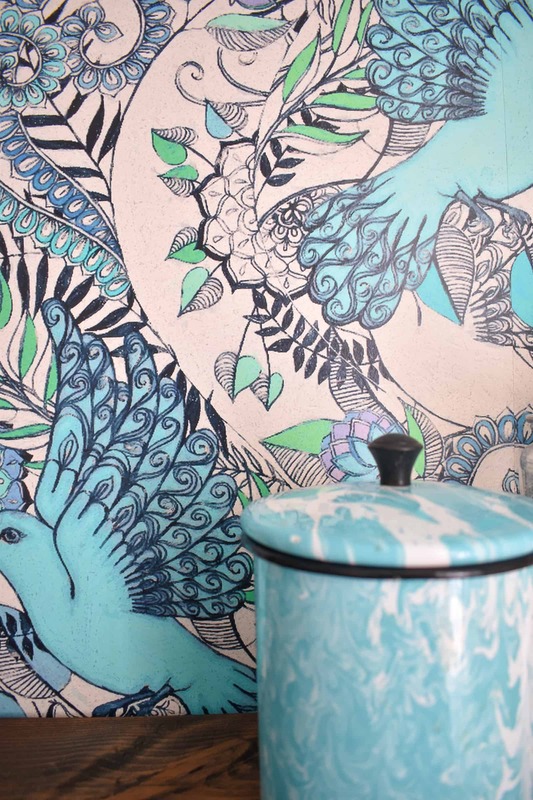 The wallpaper = love!! Isn’t it the prettiest?! So happy with it!! 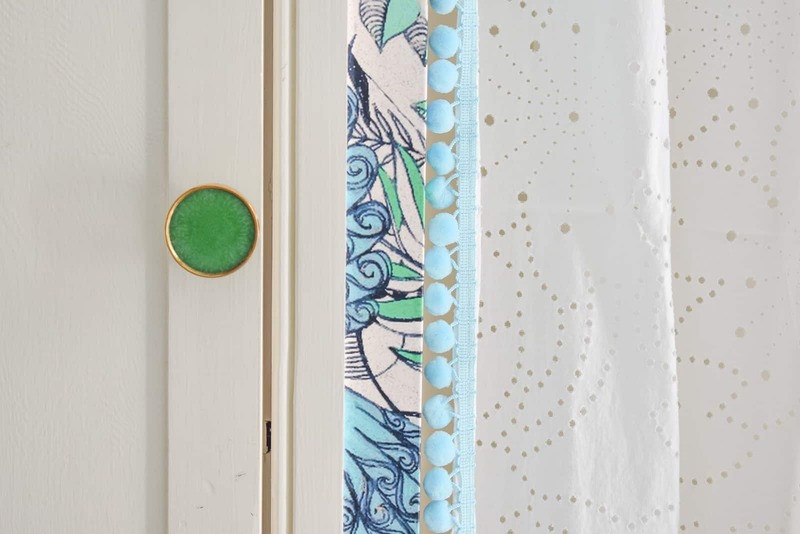 lOVE WHAT A BIG IMPACT THE WALLPAPER MAKES I THIS SMALL SPACE, SUCH A JEWEL BOX! Well done! I love it when people go bold in their design, and you did this perfectly! congrats and cheers to us for another room done! 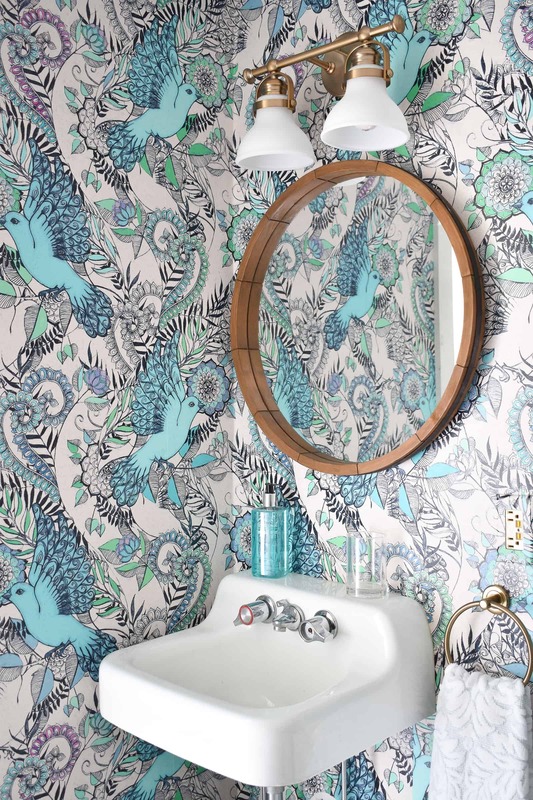 The wallpaper is fantastic! Love how the entire space turned out!